What fabric is it made of? Can you reveal what the price was? It looks divine! 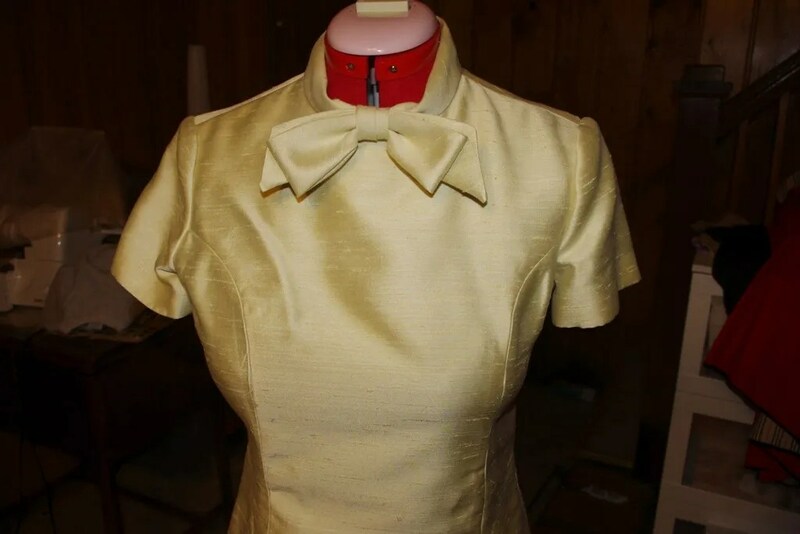 I think it’s a poly blend shantung. I haven’t done a burn test to see if it’s silk or not. It was priced at $90. What a great find. 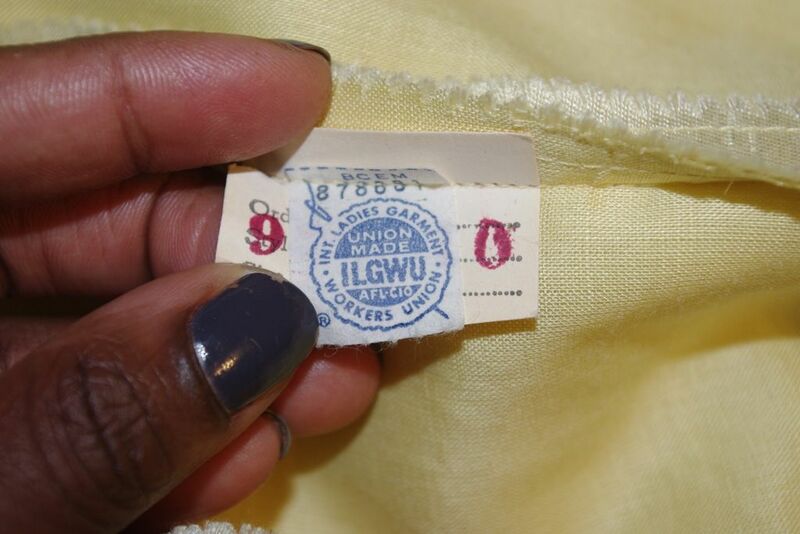 I saved a pair of 1980s era jeans for my daughter just to show her the ILGWU label. Beautiful ensemble! What a lucky find! The best part is the label and knowing where it was made! Awesome! It is beautiful! Can’t wait to see pics of you wearing it. Holy cow, that’s perfectly lovely! Take your time, but I’m looking forward to seeing pictures of you in it, at some point! What a beautiful find! I love the button/chain closure on the jacket. Thanks for posting all the pictures! wow love it! wonder what shoes you are going to put with it??? They always made vintage clothes a lot better back then! What a great dress! 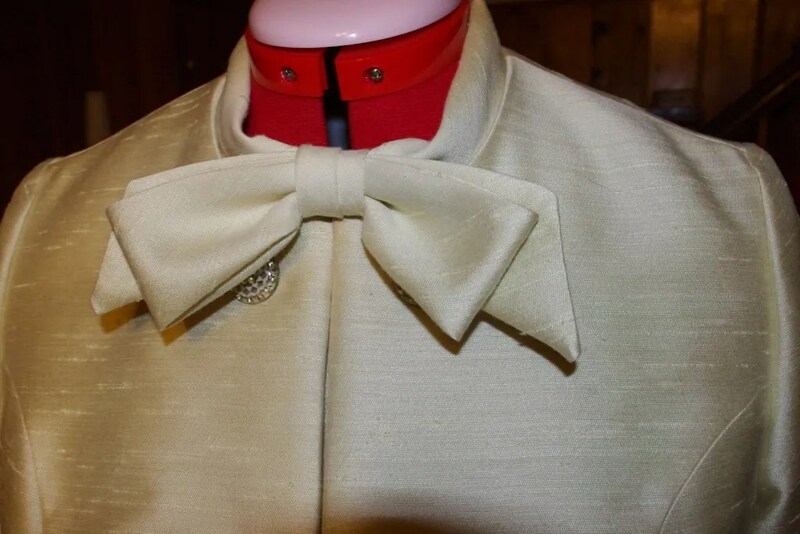 I love the bow detail and the double buttons down the front of the coat. I’ve actually never seen that technique, but I don’t spend a lot of time looking at vintage. Awesome find! Fantastic score! I well remember the union label and the cute commercials and jingle…so always look for the union label…. How sad for our country and the garment industry that those days are now gone!!! I love the dress. I’m glad you’ll be in my part of town If you get a chance and want to do some fabric shopping, stop by GailK’s http://www.gailkfabricsinc.com/welcome-fabrics.html. Oh, I’ll have to give that a try! Thank you! I really think that this is silk. It doesn’t seem like all that fine work would have been done on polyester not back then and not now. 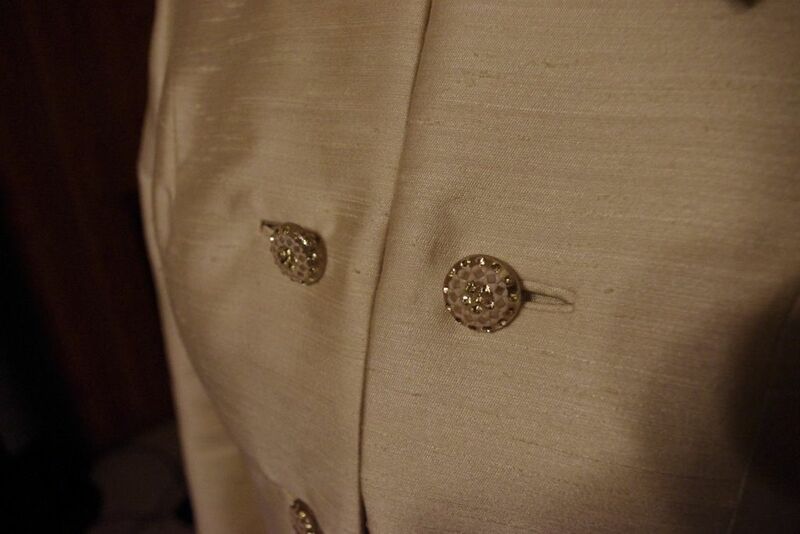 Look at those bound buttonholes! Very nice find and a steal at that price. This garment is absolutely beautiful. What a great find! Always look for the union label: International Ladies Garment Workers Union! My mom was a member. What a gorgeous dress. All of the details are stunning. Please post a pic of you wearing it. You are right, the yellow will look pretty on your skin. That’s an amazing find! It’s so pretty, and that color is perfect for you! When I was in Sweet Adelines, we had a 40’s era show. Someone raided their Granny’s trunk and found a bunch of vintage dresses. The one that fit me was awesome-a lovely green with that nice waist fitting. Imagine my delight when the gal who brought the dresses said to keep it-Granny didn’t want any of the dresses back. It’s still in my closet, but I’d have to lose a chunk of weight to fit in it now! The detailing on these old garments is amazing. I love the seam finishes – in the time before the overlocker there was pinking shears and protective rows of stitching. 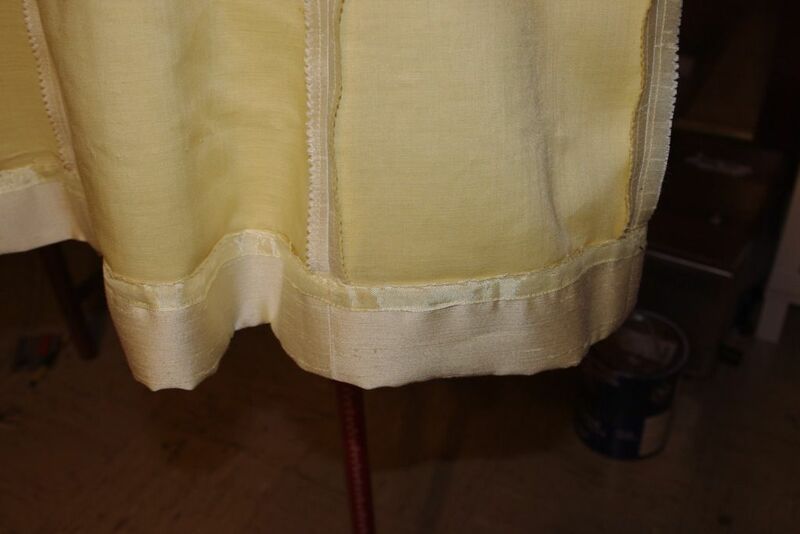 the hem finish is lovely too. Wear it well. Awesome! It has probably only been worn once, and probably to a wedding too! Isn’t it amazing how all that effort goes into interlining it, yet there is no lining. That seems to be the case with a lot of vintage, maybe lining was deemed an unnecessary luxury? But I suppose everybody had slips back then too. This is an incredible dress. Dare I ask what shoes you intend to wear with it??? The grey nail polish actually looks nice against it, too! 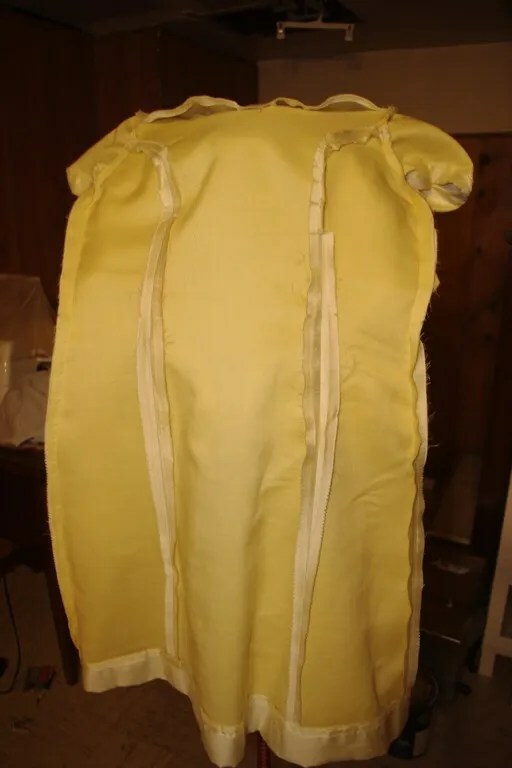 Believe it or not backing (the organza backing) was standard practice back in those days – now you understand I wasn’t back in those days (yada, yada, yada!!!! 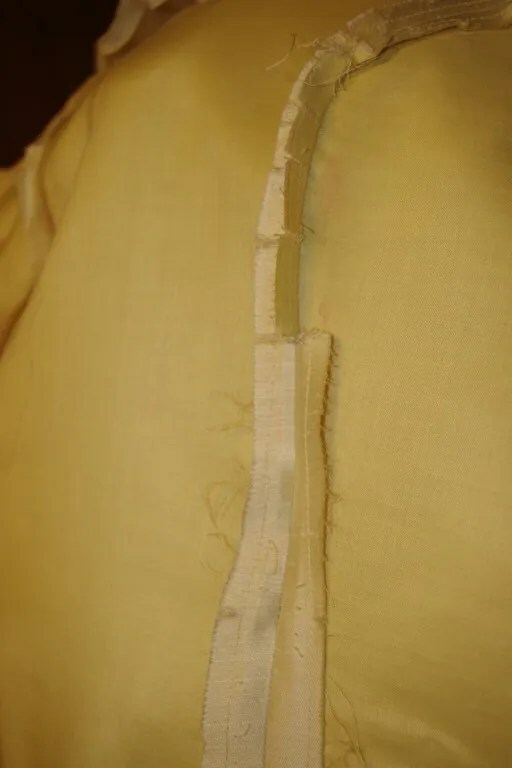 )….and pinking was standard way of finishing seams (without sergers, etc., this was probably the most economical way of finishing seams. Those princess seams were classic (see Secretariat for more princess line clothes). And most likely the reason why it fits snug through the shoulders/arms is because women were NOT muscular or even developed that much in that part of their body, and the “prototype” that designers were sewing for at the time, were not that large through their arms and shoulders (see “Gentlemen Prefer Blonds” for more body shapes). 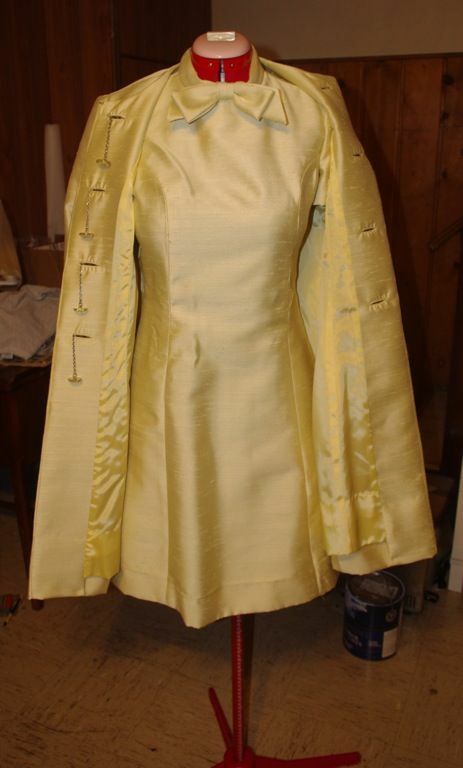 But also too much fitting with the princess seam (as in the shape of a Dolly Parton, just wouldn’t work…well it does, but it doesn’t look right and becomes problematic (that shape needs more darts to make it look right). I absolutely adore this style…you will wear this forever, and it’s classic enough to be a great go-to outfit for you. Have you thought about lowering the armhole a little to allow more room in that area?….that’s something you can do, although once lowered, you can never bring them back up again, and you would need to trim to make it work. Oh my goodness gracious golly, what a lucky find! Fate and/or God meant this dress for you. 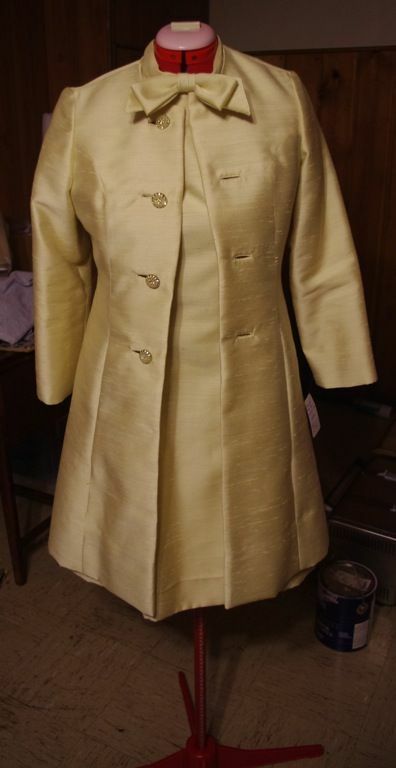 I agree that it is more likely to be silk than polyester shantung — don’t know that polyester was widely available in that weave in that era. But don’t quote me. And … vintage? Hahaha! I am obviously even older than I thought. This looks like what ladies wore to church when I was a child in the 1960s. Lined dresses were unheard-of in our off-the-rack world. Underlining is as couture as it got back then, unless you were, say, Jacqueline Kennedy. Have a wonderful time at the party. Beautiful! And with a matching jacket?! That is so awesome! What a great find, and I haven’t seen one of those labels in years. I remember seeing the commerical on TV, but only the first line and part of the second line of the jingle. Unless I needed to let it out until the seams allowance was really small, I probably would have left the finish as it was. As Claire pointed out, it was a standard for quite a while, and during that time, we expected our clothes to last. I look forward to seeing you in this, and what you wear with it. Lucky you – this is a fabulous outfit! Enjoy the wedding. What a find! Lucky you! Stunning ensemble! I have never seen that kind of buttoning – I love it. That outfit is adorable. Love the color and style for you. And the closure of the coat is amazing – haven’t seen that before. That is absolutely stunning. I was excited about the dress but when I saw the dress with jacket I just about fell out of my seat. My mind immediately started racing trying to figure out how I can recreate it. I can’t wait to see you in this!